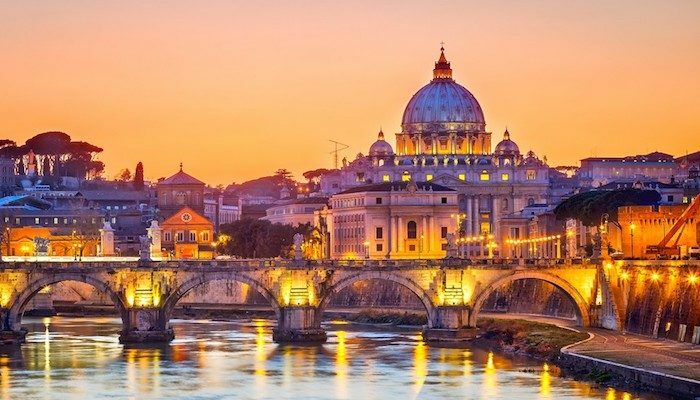 Rome, Italy is one of the world’s great cities to visit. Filled with antiquities, wonderful historic sites, lovely old neighborhoods and great restaurants, it’s also a fantastic walking city. The running scene has been improving. Yes, there are busy, traffic-choked roads, tangled lanes difficult to navigate, and the air quality can be poor in the summer — but there are great places to run within proximity to where most travelers stay. Highlights of Rome running include a nearly 9-mile “Rome Sights” tour, including some of the principal landmarks and historic sites (go early or on Sundays!). Running along the Tiber River can be a pleasure, especially since a bike path along part of it was put in a few years ago. Rome’s three largest parks – Borghese, Ada, and Pamphili are also terrific for running. And running on the historic Via Appia Antica and the Parco de Caffarella is one of the most unique runs in the world. 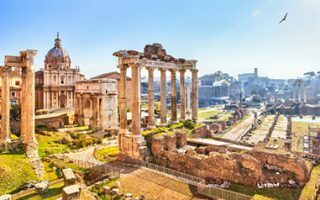 Running in Rome will undoubtedly incorporate some of its famous “seven hills” east of the Tiber, as well as Vatican Hill and Janiculum northwest of the river. In terms of public transport, there is are two metro lines, which go round rather than through the historic city. There’s an extensive bus system. 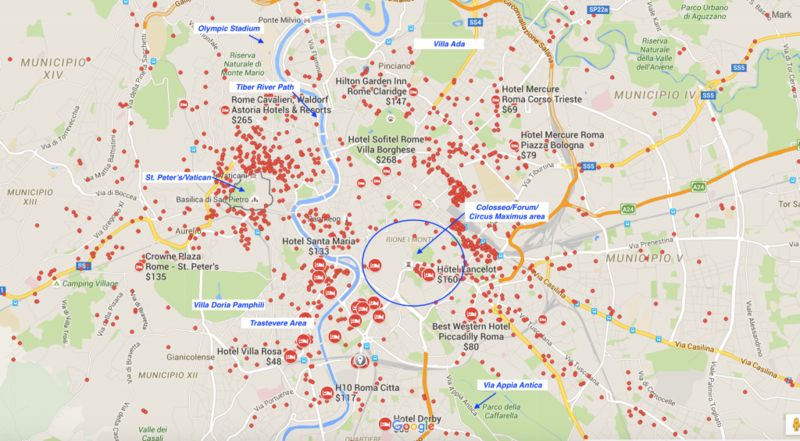 This is an attempt to put together a tour of some of Rome’s principal sights. Best to do it early before the streets get crowded and to beat the heat. Running along the Tiber River in Rome is a great way to go for a run and see the city without dealing with traffic and intersections. The 7 mile path runs through the heart of the most visited sections of the city, but below the roads. 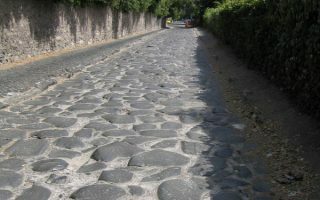 The Appian Way is one of the earliest and most strategic roads of the Roman Republic. Sections of it remain, and it makes for a one-of-a-kind run. Even the marathon in the 1960 Rome Olympics had a section on this road. The third largest park in Rome is centrally located and makes for a great run. It’s possible put together about 3 miles along the paths of the Villa Borghese. Villa Ada is a nice add-on option. 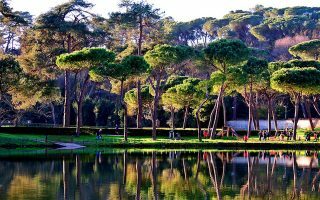 Rome’s second largest park is more wooded and less finely manicured than Borghese or Pamphili. There are numerous paths throughout the park, including the perimeter of the fort, totaling ~3 miles. 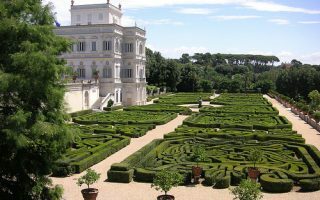 Rome’s largest park, contains a stunning, mid- 17th century palace surrounded by garden mazes, jogging trails, fabulous fountains, a superb grotto, and pine lined views of Rome from atop the Janiculum hill. 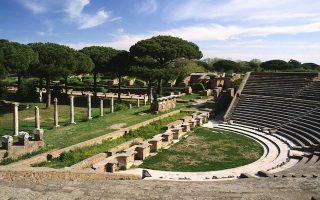 Ostia Antica was the harbor city of ancient Rome. It is now a well-preserved archaeological site, about 18 miles northeast of Rome and 2 miles from the Mediterranean. Run in the Ostia and down to and along the sea. 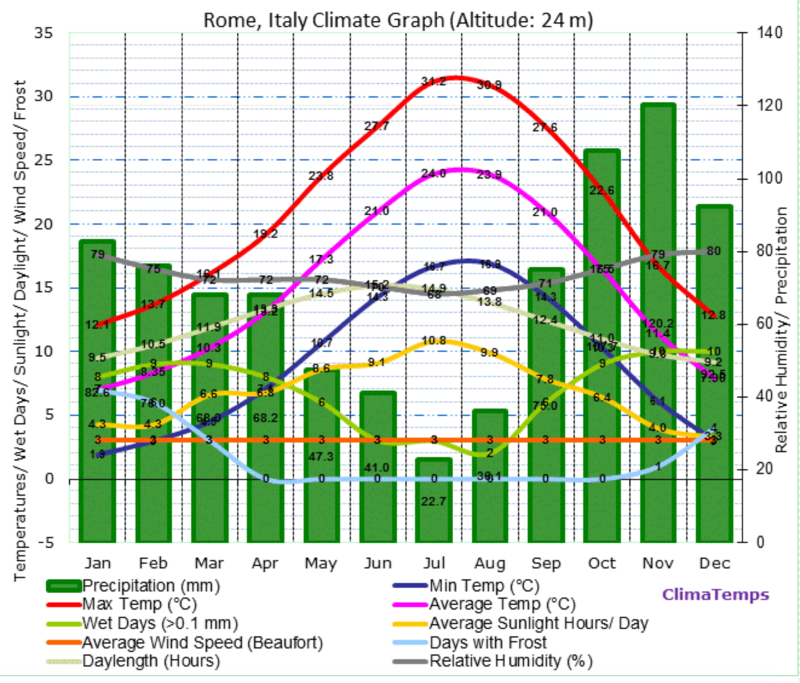 Rome’s weather is Mediterranean. Summers are hot and dry and can be uncomfortable for running. Spring and fall is almost perfect for running. Winters are mild to cool but rarely cold, with moderate rain. Snow and freezing temperatures are rare. Like any major European city frequented by tourists, there is a huge choice of places to stay. Pretty much anywhere you stay in the most visited parts of Rome will provide access to some of the runs in this guide. A few recommendations, for runners. Trastevere area. 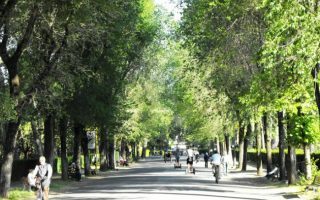 Lovely neighborhood, close to river path, major sights, and a couple of miles from Villa Doria Pamphili park. Near Borghese Gardens. 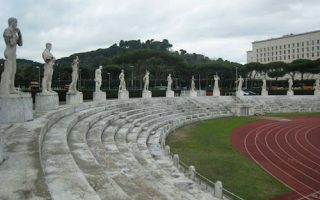 Great running there, can combine with Villa Ada Park to the north, or Tiber river paths. Also not too far to major sites such as the Vatican, Spanish Steps, Colosseum. Near the Vatican. Good access to the Tiber River paths and the Villa Dorian Pamphili park. Near the Colosseum. If you stay just south of the Colosseum, good access to running around there, Circus Maximus, and Parco della Caffarella & Appia Antica. There are not as many specialty running stores in Rome as in other cities of its size. Each of the major running companies — Adidas, New Balance, Puma, and Nike has a store neat the Villa Borghese. A few of the specialty stores. Footworks. Centrally located in San Giovanni area. Also close to Villa Ada and Parco Caffarella. Rome has guided tours. And here. AUR Runs Rome. The American University in Rome has an active club and meets regularly for group runs. Rome Marathon. April. Gorgeous race through the heart of some of Rome’s great sights. Ostia Half Marathon. The varied course ROUTE is a fast one with some light up-and-down hill stretches. Starting near Palazzo dello Sport, the route runs in Rome, through the entire length of via Cristoforo Colombo then up and down the seafront, 280m each way, to the finish line at the round-about. (La Rotonda).